The LCD on my Sharp microwave oven recently failed, beginning with a few segments but quickly getting worse. I’ve seen quite a few similar models with the same problem and a quick Google search proves this. Sharp even offered a recall at one stage. If your microwave oven suffers a similar fate and you could give this a try. Note that it is not actually an LED display as some seem to think; Sharp have simply done a pretty convincing job of making the LCD look like one. First up, only open your microwave if you have experience working with electrical devices. Microwaves operate using very high voltages that can remain stored in a capacitor even after switching the unit off. Disconnect the microwave from the supply and remove the cover. Do not touch the magnetron, transformer or capacitor. Take a note of all the connections to the power supply PCB on the rear side of the front panel. Disconnect all of the wires. 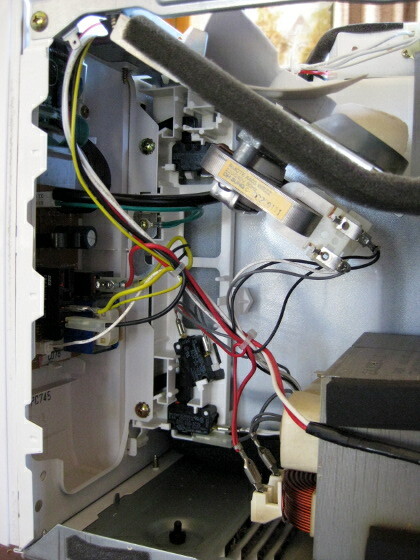 The front panel is held on by a single screw near the top. Once this is removed, open the oven door and slide the panel upwards to remove it. 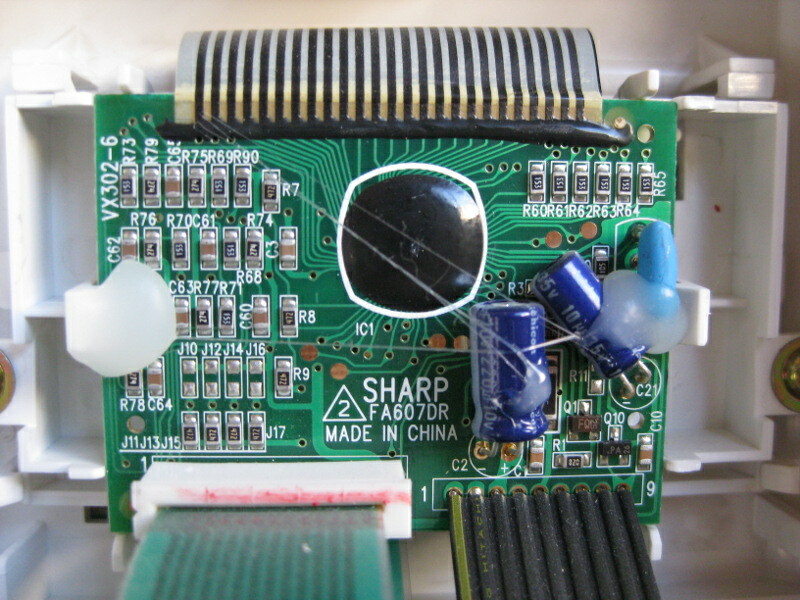 The LCD is mounted on the back of the controller PCB and connected via a ribbon cable. This cable is attached using what appears to be conductive glue. I guess this glue breaks down over time causing dodgy connections to the LCD. I was able to mostly fix the display in my microwave simply by running a hot soldering iron across the black glue. This may work for you. It will probably require some trial and error until the display works. Just don’t connect the microwave to the mains supply with the cover removed! I decided to scrape all of the black glue off and repair each joint using a conductive pen. As the pen is quite clumsy (it’s basically correction fluid with silver instead of white pigment) I found it easier to draw a continuous line across the contacts, then carefully scrape away the excess between each pin. Afterwards I covered it with a strip of hot glue for protection. While not particularly elegant this has fixed the display completely! Thanks so much nzlamb!!! I too googled for about a hour and because I was so scared of the capacitors I took it very slowly. Can I please add a few comments? My model was R350E and my fix was even easier. So many people have missed the obvious. Take out the front panel as above. I did not have the black line of rubber tha you can see in this photo. I did not use a soldiering iron but instead used the tip of a hot glue gun by itself. (Minus the hot glue) The larger 11mm glue stick type and not the thinner glue stick. My logic was that it should be the perfect temperature for remelting the glue. IT WORKED PERFECTLY THE SECOND ATTEMPT. I have a Sharp R350E that is terribly loud…….the customer service person’s answer to my inquires was “I’ve never heard of a loud microwave”…..good for him! (I should just go away. They must pay him to just get rid of people.) He wasn’t helpful at all and inferred it just doesn’t happen – I must be imagining it. I took it to a local service person ($40.00) instead of incurring even higher costs of an in-home vservice call and the service man said “Wow, this is a loud microwave!” Turns out it’s a loud transformer and I get to pay $160.00 if I want to hear other people talk while in my kitchen with me. New microwave exact model is $288.00. ANy chance you know where I could get a new transformer…. the microwave works perfectly. Just two of us and 2 years old out of warranty etc. Thanks so much! If you are in NZ then the law (Consumer Guarantees Act 1993) should be on your side with this one. I’d recommend taking it back to the retailer you purchased it from and demand that they repair it due to it not being of acceptable quality and not lasting a reasonable lifetime. The Act applies even outside of the warranty. I have successfully exercised my rights in the past and had faulty goods repaired/replaced outside of the warranty period at no cost to myself. If you don’t live in NZ then I’m not sure what local laws apply for you. Unfortunately I’m not sure where to buy microwave oven transformers. TradeTech sell microwave oven parts but I don’t see any transformers on their site. I’d imagine they would all be pretty expensive though as they are quite bulky. What about eBay, or scrounging around for a similar, older model (like one with a dead display!) and seeing if the transformer fits? I have a sharpe microwave model # r-1481. It has no sound when you push the buttons. It also does not beep when it is done. The fix works well but the display is still a bit dim if a lot of characters are displayed. Was a bit worried how much heat the cable could take so have taken it pretty easy with the soldering iron. Was good to see the LCD work again as the rest of the appliance works really well. Hope the newer models have fixed the design fault. We also tried with a soldering iron, the first time we got more display but on second attempt we accidently burnt through some of the ribbon:( I was shattered. We then attempted a repair with some metal melted with the iron but caused more holes and when the patch was finally done we turned on the microwave only to discover that the back light is working with absoltuely no display. I am so dissapointed. Our only hope now is to find on old one no one wants and swap the display. But then again if we do find a microwave thats the same we will just use that and throw this one away. Sooo shattered, it does work but be careful this dosent happen to you!! The correct way to do this repair is to use ‘3M 9703’ tape. Do you lay the tape along the long axis and scrape away the conductor in between the strips? I tried it today and burnt through the ribbon also. I thought there would have wire behind the ribbon. My MIcrowave did not also have the black strip, however I used the hot glue gun like Wayne above and it fixed the LCD display. Thank you very much for your great advise. My microwave didn’t have the back strip. I had a small hot glue gun that i had not used in years I am glad I didn’t throw it away. I ran the glue gun several times on the strip and it worked wonderful the first time. Thank you all for all the advise I saved about $150. Hi, I would like to have a go at mending the LCD on my Sharp microwave and having read the advice above have just one question. In order to access the strip is it necessary to open up the back and do all the disconnections mentioned by the first person before you can remove the front panel ? I must admit I am a little apprehensive of fiddling round near capacitors etc. I may be reading it wrong but from Wayne’s description it seemed that you could access the strip just by removing the screw and sliding out the front panel. Thank you from me too. My microwave LCD had been gradually fading for years, finally just going dark. The microwave works fine, so we just have been running it blind. I saw your blog entry and decided to try it. IT WORKS. My microwave did not have the glue as yours, but the same as other posters. The hot glue gun (minus the glue) fixed it just fine. And as a bonus, the same thing worked on the dead LCD on my AT&T phone (CL2909). It had been dead for years. Now it works. Wonderful, thanks!!!!! Thanks! Our Sharp R-490C(S) microwave LCD screen died about 5 years ago. You know the story…other than the LCD it worked fine, you just had to guess what you were doing a bit. Today a local retiler (Neol Leming had 25% off all microwaves, so we decided on a model to get and were walking out to the car…. Actually my wife was outside waiting when I had one more look at Google and found your amazing advice. You saved us lots of money today, NZlamb, and even better stopped stuff going to the waste stream. Used Wayne’s hot glue gun method on my Sharp R-653M. After second attempt works as good as new. Make sure you apply careful pressure to each terminal in turn but not too long. Brilliant tip, thanks a lot. Wow. Thanks for this! Been living with missing segments for actually a few years. It was always usable, but kind of annoying every time I looked at it. A cheap microwave and tempting to just replace, but I hate that kind of waste. Tried Wayne’s hot glue gun fix and all is good. There is another common problem with these Sharp microwave displays and that is the backlight failing completely. It is simple to fix: take a ultraviolet or white 3mm LED with pre-soldered resistor rated for 12VDC and with pre-soldered leads and solder it to the points on the circuit board that are meant to feed the failing LEDs. You can use a multimeter and follow the traces to locate where the +12VDC and ground points are. Unfortunately, the replacement LED will also get burned out over time because whatever overcurrent or overvoltage condition burnt out the original LEDs is still present, but at least you can breathe new life into the backlight with a component that can be had for less than $1. Thanks to the OP for this great blog and tip! i have a sharp # r-1502 is the repair the same? thanks, Roy. My father-in-law loves his old Sharp microwave and is too old to easily learn a new one – otherwise I wouldn’t have even tried the opening up a microwave as detailed here. My first obstacle was just getting the cover off – two of the screws were odd star-with-center-peg things that I almost gave up on, but finally managed to get out with careful use of pliars. Then once I finally got inside and got the board got the out, the ribbon connector did not look like the photos – that is, no line of black glue, just an almost invisible very thin transparent glue strip. Figuring I had nothing to lose, I ran a glue gun up and down it a few times, put everything back together, and the display worked perfectly! If I can do it, anyone can. Unable to try this fix because I can’t get the screws out to take it apart. They have a special head that requires a tool that I don’t have. All the ones I’ve seen so far use Phillips screws. Many exotic screwdrivers are pretty cheap and easy to source from the likes of dx.com these days so that could be worth a try. Do you have a photo of the screw head? I don’t know how to post a pic so I used it for my avatar. There is a warning on the back not to remove the screws because of high voltage. Tried the dx.com but didn’t know what search term to use. That’s just a Torx screw – they are quite common and most hardware stores sell compatible screwdrivers. I thought it was a Torx as well, but there is a hump in the center that makes it impossible. Also none of my torx would fit it. Sorry I didn’t see that in the photo at first – it’s a ‘tamper proof’ Torx. Even these drivers are normally quite easy to find in most good electronics or hobbyist stores. In fact one of the local hardware stores here (Mitre 10) sells this exact kit off the shelf for less than NZ$20. It’s worth having a set as a lot of appliances these days use these type of screws. After I fixed my no power R350E by replaced the fuse I decided to give it a try to fix the LCD. Mine also without glue and the LCD screen is dots instead of lines. I bought a 10W $10 cheap glue gun and restored around 90% of the screen but still not as bright as the OP’s one. I am not sure is it because of 10W not enough? I think may be the microwave already getting old more than 10 years. This method works for me, and I did something far less damaging than a hot melt glue gun. Ground yourself before touching the circuit. Clean the area with isopropyl alcohol, let it dry, then use a hair dryer to heat, the eraser end of a pencil to push down. Less than a minute, you don’t want to apply more heat than is necessary. And you don’t even have to remove the board from the touchpad panel! Thank you for posting these ideas! It actually worked!!! I’m in awe, thanks for this posting. I used a heat gun with a spreading tip (didn’t have a fine tip) on medium low setting and didn’t leave it aimed on one spot more than a few seconds. I pressed down on the glue [conductive] strip with a 1/4″ piece of wood. I made about 4 passes over the strip pressing along the entire length. Even with the low heat I managed to slightly deform the plastic right above the LCD ribbon strip because I was concentrating of the conductive strip and didn’t notice the plastic starting to deform. Sharp R-820BK for an RV (or caravan as you say ‘down under’). It bleedin’ works! Can’t believe it, so simple yet totally effective. My model is Sharp R-350E, purchased in year 2000. Having only soldered before, I was hesitant to even open the microwave, given the voltages that can be present. Thought it would be safe after being unplugged for a few days (I’d been turning it off at the power point anyway to save the pixels..) Then, after taking out the control panel part as described above, and taking a few pics so as to plug it back together correctly, I used the glue-gun technique and now it’s as good as new – from < 20% pixels on to 100%. It took many seconds of back-and-forth wiping of the ribbon contacts for the glue to melt – you will see or feel it change – and a few trials before I saw any improvement. So I think the glue gun (I paid $12) is just the right temperature for this job. Also, the ribbon didn't seem to want to dislodge itself, which was another fear. I used a spatula to press down where I'd heated, but methinks this was unnecessary. 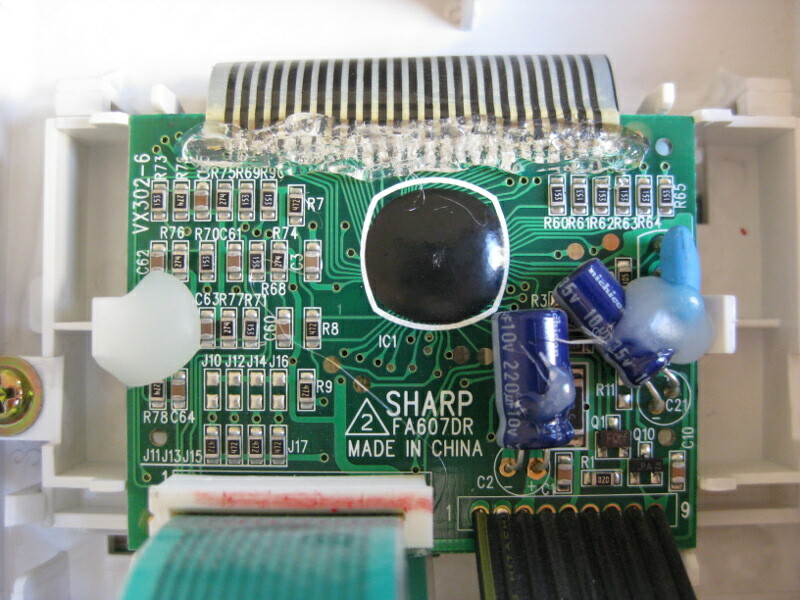 The other thing I noticed was the green ribbon connected to the same board was loose – the white cap (mine also has a red dot) had raised probably through vibrations – and I accidentally pulled the ribbon cable out. Was easy enough to push it back in, then push home the cap. Thought this might have been causing the display problems, but it had no effect. So I used the glue-gun technique. One happy customer. Wish I knew how to embed links to before/during/after photos. Thanks to the poster for identifying the problem area. This can be fixed without heat, just rub something plastic (credit card, etc) across the ribbon cable where it sits on the board. The contacts are oxidized (fretting). As you rub with pressure the segments will start to work better and better. Most above mentioned trying a few times with pressure of some sort, but it was the pressure and rubbing that caused better contact. My LCD had several lines not working. My Sharp R419CK also did not have the glue strip, just the black tape one side, looks like connections on other. Ran a soldering iron NEAR both ends of the connection, NOT on it, and now the display works brilliantly! Thanks to everyone! What is the plastic tube thing on the outside back of sharp microwave called/purpose? Thanks. Thanks so much for your blog. I had already ordered a new Sharp microwave and then saw your blog. I was bored and decided to try your fix and it worked with just heating from a soldering iron. Now I can return my new one.